There are two three-day sessions offered during winter break from school. Each session can accommodate 16 campers who will be divided into smaller riding groups. 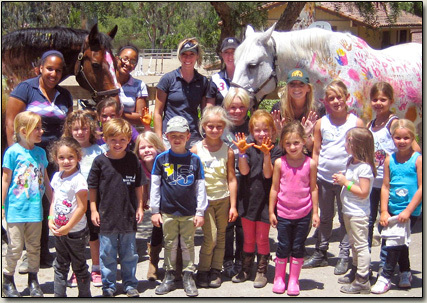 Campers will groom, tack up/down, and ride our lesson horses. In the event of rain, we will work with horses in our covered cross tie areas and in the indoor barn aisle. If rain precludes riding, we have a number of riding/compensation options from which to choose. Riding instruction will be in the English style. Focus will be on equitation as the most effective way to ride and will stress proper use of hands, legs, and body position. We have a variety of wonderful horses and ponies that know their job and are used to working with children. * There needs to be a minimum of 5 campers per session for the camp to operate.